Deana Carroll, currently lives with her son and cat in a pretty house by the pinewoods in Formby, Merseyside. She worked as an administration officer in the Civil Service since leaving school and has written many poems and short stories for personal pleasure. She was brought up with very moral values, but discovered after her divorce in her mid-thirties, that being immoral was much more entertaining! In 2012, Deana needed to take several months off work due to a mystery illness. During that time she resuscitated an abandoned story that lay festering at the back of her wardrobe. This time the ideas flowed and the initial two thousand words quickly expanded to sixty thousand. 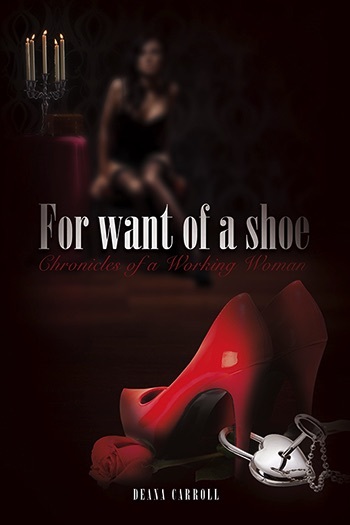 This book, For Want of a Shoe, contained everything that Deana loved: shoes, chocolate and most of all, adult fun!